Parrot food pellets made with certified organic ingredients, manufactured in a cold pressed process. They are readily accepted by most parrots. 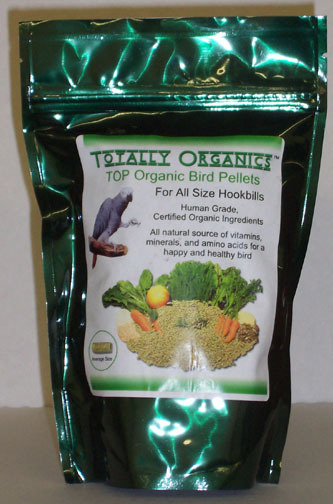 All Natural source of vitamins, minerals, amino acids, and other nutrients for a happy and healthy bird. No Artificial Preservatives like BHA, BHT or ethoxyquin. No artificial colors or flavors. No artificial vitamins. No sucrose/sugar added. No Animal Products or animal by-products. Use these pellets as an important part of a complete diet. Feed approximately as much as your bird will consume in a day. Some days birds will eat more than others so the amount will fluctuate. Discard the remainder and feed fresh pellets each time. Consult your avian veterinarian if you have any specific diet related concerns. Although an excellent source of protein, vitamins and minerals, we believe that no pellet can provide 100% of a bird’s nutritional needs.